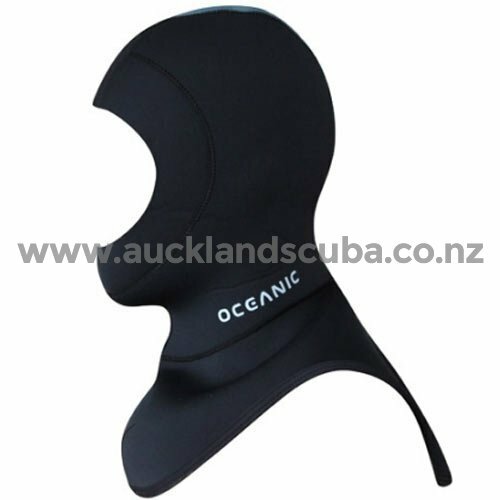 The 5 mm Hood is ideal for divers who Chill Easily in Warm Water and Cool Water. Hood is constructed from 5 mm Titanium Lined Nylon Elastiprene Neoprene throughout the Hood and Neck areas, has a Large Bib that Tucks into the Wetsuit for a Better-Seal and Greater-Warmth, Smooth-Skin Outer Surface on Bib Creates Seal against Wetsuit, keeping Water Out, and 3 mm Face Seal with Smooth-Skin Seal Minimises Water Exchange. The Face-Seal can be Trimmed to any desired size; Automatic Vents allow Air-to-Escape as necessary from the Top-of-the-Hood while Restricting Water to Re-Enter. Hood is equipped with Reflective Rear Pattern for Instant Recognition and Safety. Hood Seams are Double Glued and Blind Stitched for Strength, Durability and Added Warmth. Hood can be worn with any Brand or Style of Wetsuit.